I can’t believe we’re already into the end of October and Christmas is only two months from today. It’s hard to already be welcoming the holidays, but it’s easier to start working on them now so as to enjoy them when they come. A favorite book of mine is Unplug the Christmas Machine by Jo Robinson & Jean Coppock Staeheli. My sister and I worked through it together over 20 years ago and it profoundly changed our holidays, making them much more enjoyable. It’s not just about starting earlier, it’s also about prioritizing and being selective. Priorities shift also, so this is not a one-time solution. When I had a small child at home, making cookies was an important part of Christmas. So was visiting relatives and decorating a Christmas tree. Now that I’m an empty nester, I have a child who cannot travel away from her dogs. Her Dad and I have to go to her. That impacts what’s important to how I celebrate the holidays. I don’t decorate outside and I bake only 1 or 2 small batches of cookies. I don’t visit other relatives as they are too far away and my vacation days are used to see my daughter. A relaxed and loving time with the family. An evenly paced holiday season. They also have some great discussions about reviving the joy of Christmas, identifying hidden gift giving rules, and communicating about expectations and changes to the holiday traditions. Make a list of everything you feel needs to be done for the holidays. Prioritize them – what’s the most important, what’s the least. Give some thoughts as to the reason for the items on your list – why is it important or not important? Can something be changed to make it manageable or meet the need without being a hardship? From this list, decide what has to be done, what you would like to do, and what does not have to be done. Review it frequently so that when decisions are made, you know if it fits into your goals or not. For me, I enjoy decorations, but not having a tree. I put up garlands with lights, a fiber optic lit train, and a large artificial poinsetta. Simple and fast to put up and take back down. The thing I hated the most about a tree was how tired I was when it came time to take it down. I gave it up when we got the kitten (aka cat #3). I enjoy staying in touch and a Christmas letter is the time for it. For me, it’s a big production of choosing pictures, updating addresses, and writing up our year in a way that is short and interesting. Last year, I did it electronically on Shutterfly and it seemed to work well. One year my sister, her family, and my mother traveled to see us for the holidays. While they stayed in a hotel, our town was small and had no restaurants open after 3 pm on Christmas Eve. That meant I had to provide four meals plus nutritious snacks. My sister and I found years ago that keeping everyone in a good mood, including husbands, was easier if they had high protein, low sugar food available all day instead of cookies and candy. I didn’t think I could serve a big Christmas Day dinner and enjoy my company. I made several pans of lasagna for dinner on Christmas Eve, quiche for breakfast (mixed up several days earlier), and a lavish spread to “make your own sandwich” for lunch. Christmas Day dinner was pot roast that I cooked the previous weekend and only had to reheat. Along with egg noodles and some vegetables, it was a delicious meal. Afterwards, we had an ice cream cake from Dairy Queen. It was easy to get on the table and easy to clean afterwards. I hope I’ve given you some ideas to prioritize, simplify, and enjoy your holidays. Start now – it’s not too late. I’d love to hear some stories of what you’ve done to make your holidays more enjoyable. Word for tomorrow – VERTICALLY. If you prefer to work ahead, see the list for the week under “A Word A Day”. I love your cake. I have no idea what to do for the holidays but I will get more creative that is for sure. I plan to do a Martha Stuart craft, where I take wrapping paper and or Material and cut and glue it to clothes pins and make something. I hope it turns out ok.
It’s just fun trying different things even if they don’t turn out. A timely post. I expected I see a family picture but I’m glad you shared the Christmas cake photo instead. Very clever that a Santa cake can be made from a heart shape. 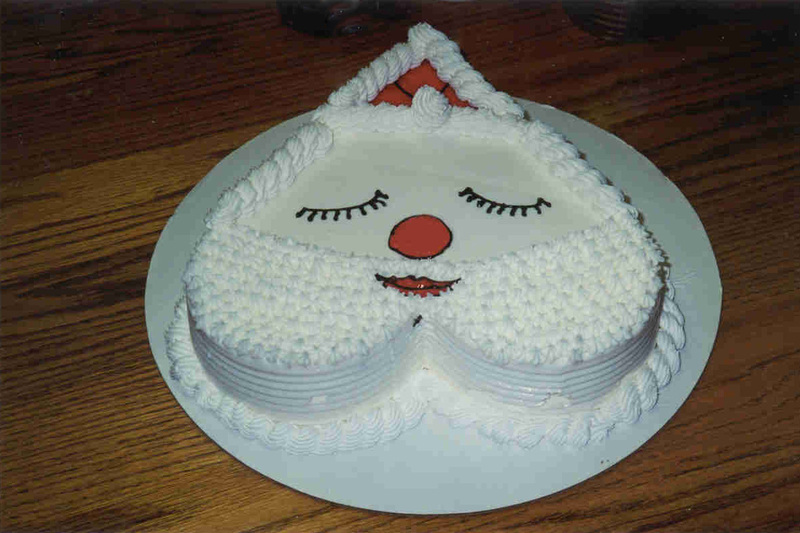 I grew up with an aunt who did decorated cakes for everything. My brother is actually the family member who does the best cake decorations (art school grad). I’d done so many family photos lately that I thought this would be a nice change of pace. For not doing a homemade dessert, that DQ cake was a wonderful substitute. It’s probably not hard to learn the basic techniques for cake decorating, but I sure don’t have the patience for all the fine movements, let alone the creativity to come up with the ideas. I agree, a friend and I just read Simplify You Holidays by Marcia Ramsland (http://organizingpro.com) and your ideas could have come right out of her book. Her book does look interesting, as does her website. Thanks for passing along. If “Unplug The Christmas Machine” is getting ready to go out of print, it will be nice to have something else I can recommend. I enjoy your letters, no matter how frequently they may or may not be.